For more info, visit janm.org/grb3. 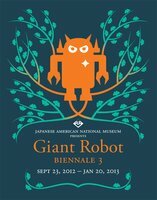 This exhibition is another in the Salon Pop series, which provides short-term opportunities for the Museum to present the creative talents of Japanese and Japanese Americans whose unique and innovative work is currently having an influence on American culture. JANM . Last modified Jan 28 2013 2:32 a.m.